As I was researching to apply for a First Families of Floyd County, Indiana certificate last year, I came across one ancestor in the line who proved difficult. Milton Rakestraw. I always “knew” he was the son of Charles and Syntha (Irey) Rakestraw simply because my grandparents had said so. Luckily, Milton was born into a large family and I was able to research his siblings for more information. I began with the one census record he appeared on. In 1850, he was living with his wife and three sons in Jeffersonville, Clark County, Indiana. A William Rakestraw was also living with them. Based on William’s age, birthplace, and location on the record, I believe this is Milton’s brother, William Arlie Rakestraw. I looked for information on William Arlie and found a marriage record. He married Mary C. Neighbors in Floyd County, Indiana on November 3, 1867.4 I then found William and Mary C. Rakestraw living in New Albany in 1870. An Elizabeth Flora was living with them.5 This could be his sister, but there is an age discrepancy. Additionally, Elizabeth seems to have disappeared after 1850, when she appeared on the census with her father and three of her sisters. I decided to look for the daughters of Charles Rakestraw that were listed on the 1850 Census. I started with Adeline. From the census, I know she married Henry Hardy.8 I found their marriage record, dated August 26, 1847 in Floyd County, Indiana.9 Henry and Adeline lived in Lawrence County, Indiana in 1860. Also living with them was Arvine Rakestraw.10 Based on occupation, age, and name similarity, I believe this is William Arlie. I have been unable to find William Arlie in the 1860 Census with his first or middle name, which lends credibility to this theory. The 1860 Census also shows that Henry and Adeline have a son named Milton.10 Presumably, this son was named for Adeline’s brother. I moved on down the list and looked for Susan Rakestraw. Susan married John Flora on March 6, 1851.11 I couldn’t find any information that would link her to Milton. I looked for Minerva next. Minerva married Charles Ennis on June 12, 1864.12 Again, I found no evidence linking her to Milton. At a loss, I decided to compare the make-up of the 1830 and 1840 Charles Rakestraw household to what I know of his family. My speculation on the Charles Rakestraw family in 1830 and 1840. There is other evidence, or perhaps lack of evidence, that I believe confirms Milton as a son of Charles. I searched the 1840 Census for all Rakestraws living in both Floyd and Clark counties. Charles is the only one. I performed the same search for 1850. Charles and Milton are the only Rakestraw patriarchs in both counties. From this, I think it’s safe to say they are at least related. When taken individually, none of these pieces of information can prove Milton’s lineage. However, taken as a whole, they make a pretty compelling case. 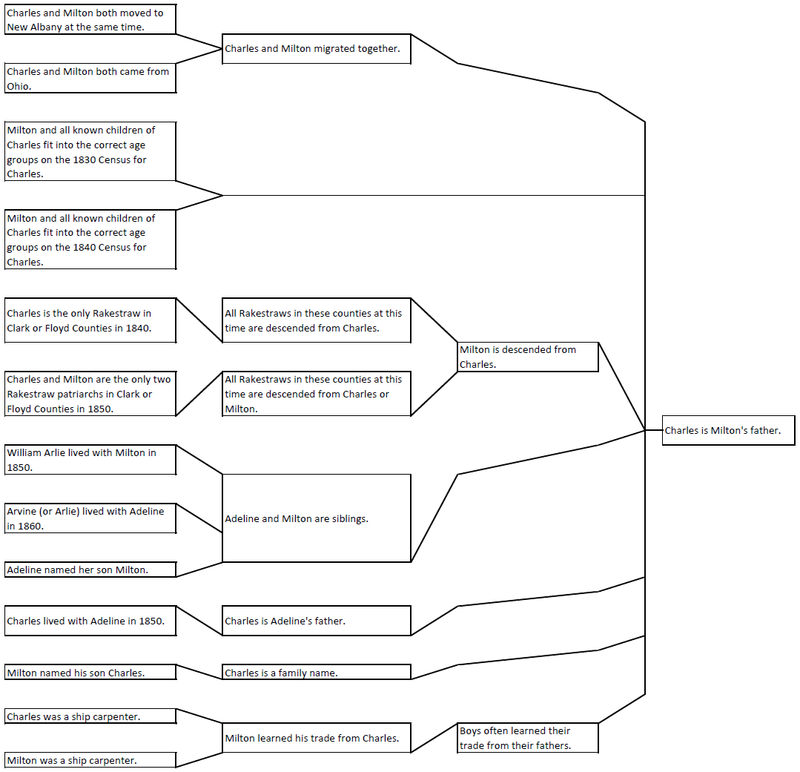 It’s often difficult for my analytical mind to keep all of these abstract details together, so I created a logic diagram of the circumstantial evidence and how each piece corroborates the rest to form the conclusion that Charles Rakestraw is the father of Milton Rakestraw. 1850 United States Federal Census. HeritageQuestOnline.com, 2009. Web. 12 Jun. 2011. Jeffersonville, Clark, Indiana. pp.313-314. Family #256, lines 40 and 1-5. Ang, William, Marguerite Ang, James Thornton Eiler, Jackie Murray Nance, and Shirley Wolf, comps. Fairview Cemetery: September1, 1852 to November 18, 1865. Vol. 1. New Albany, Ind. (P.O. Box 665, New Albany 47151): Southern Indiana Genealogical Society, 1989. Print. The Indiana Southern Counties Collection. p.62. Floyd County Clerk. Microfilm. Floyd County, Indiana Marriages Volume B (1845): p.147. Accessed 23 Sep. 2014, Stuart Barth Wrege Indiana History Room. Floyd County Clerk. Microfilm. Floyd County, Indiana Marriages Volume 6 (1867): p.372. Accessed 13 Jun. 2011, Stuart Barth Wrege Indiana History Room. 1870 United States Federal Census. Ancestry.com, 2009. Web. 17 Aug. 2014. New Albany, Floyd, Indiana. p.9. Family #70, lines 20-23. “Local Gatherings (Death Notice).” New Albany Evening Tribune 21 November 1904, Monday ed. : 4. Print. column 2. Accessed 18 Aug. 2014, Stuart Barth Wrege Indiana History Room. Clark County Health Department. Microfilm. Clark County, Indiana Death Records, Book H-28 (1904): p.16. Accessed 03 Sep. 2014, Jeffersonville Township Public Library. 1850 United States Federal Census. Ancestry.com, 2009. Web. 08 Nov. 2011. New Albany, Floyd, Indiana. p.421. Family #549, lines 5-12. Floyd County Clerk. Microfilm. Floyd County, Indiana Marriages Volume 3 (1847): p.101. Accessed 09 Sep. 2014, Stuart Barth Wrege Indiana History Room. 1860 United States Federal Census. Ancestry.com, 2009. Web. 09 Sep. 2015. Shawswick, Lawrence, Indiana. p.126. Family #858, lines 1-8. Floyd County Clerk. Microfilm. Floyd County, Indiana Marriages Volume 3 (1851): p.332. Accessed 09 Sep. 2014, Stuart Barth Wrege Indiana History Room. “Indiana Marriages, 1811-2007,” database with images, FamilySearch (https://familysearch.org/ark:/61903/1:1:VKJD-CWT : accessed 17 August 2014), Charles Ennis and Minerva T Rakestraw, 12 Jun 1864; citing , Lawrence, Indiana, county clerk offices, Indiana; FHL microfilm 1,317,626. 1830 United States Federal Census. Ancestry.com, 2009. Web. 15 Dec. 2014. Hanover, Columbiana, Ohio. p.486. Line 18. 1840 United States Federal Census. Ancestry.com, 2009. Web. 09 Sep. 2014. New Albany, Floyd, Indiana. p.255. Line 16. This entry was tagged 52 Ancestors, Adaline Hardy, Adaline Rakestraw, Adeline Hardy, Adeline Rakestraw, Charles Ennis, Charles Rakestraw, Floyd County, Henry Hardy, Indiana, John Flora, Milton Rakestraw, Minerva Ennis, Minerva Rakestraw, New Albany, Ohio, Susan Flora, Susan Rakestraw, Syntha Irey, Syntha Rakestraw, William Arlie Rakestraw. Bookmark the permalink.